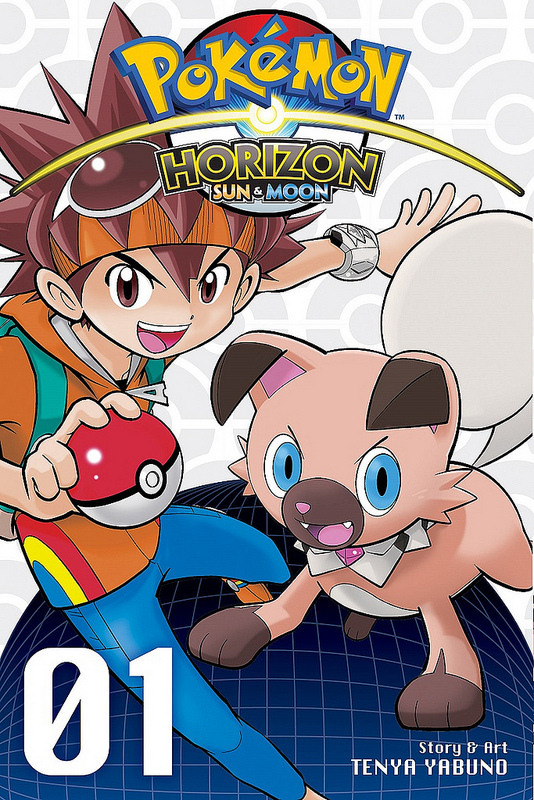 It’s time to look at a fairly unknown Pokemon manga. Horizon is so unpopular that almost no images come up when you google it. 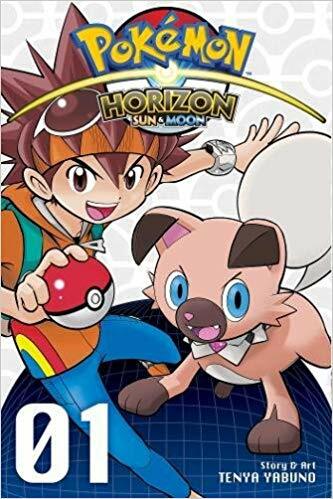 It’s not all that surprising as the series is only 2 volumes long and Pokemon is so huge that you can’t remember every part of it. It’s a decent manga, but one that does enhance the injuries a bit too much. You can sort of see the anti-battle point here as Pokemon battles don’t appear to be any fun for the Pokemon. On the contrary, they appear to be quite painful. The series starts off with a boy named Akira. He’s ready to take the world of Pokemon by storm, but doesn’t yet have one that he can use. He meets up with a girl named Mana who isn’t a big fan of Pokemon fights herself. As a result she is a little alarmed when a Rockruff appears and seems to be a battle fanatic. Rockruff just wants a good fight and is willing to do whatever it takes to get that. Akira quickly realizes that being this Pokemon’s trainer won’t be like a usual arrangement. Rockruff is going to do his own thing no matter what. Akira can assist him or not. Akira decides that he might as well tag along and he’ll give his Pokemon advice from time to time in the hopes that the Pokemon will listen. Of course there is an evil organization out there as well so Akira will have to be careful. Rockruff may be more special than he knows. We’ve gone through the rebellious Pokemon type before, but never as a whole series so that’s a unique spin for this title. Even by the end Rockruff definitely has his own personality. He’s definitely not a yes man who will do whatever Akira says. It does tend to backfire on him quite a bit though. He’s reasonably intelligent but against a trainer/Pokemon combo it’s just not enough. You effectively have to out think two opponents. Mana tries to break up the fights many times, but Akira sticks up for Rockruff’s decision to fight. This is where things get tricky. Akira believes that as Rockruff’s trainer he has to support whatever he does. Even if both of their lives will be in danger for no real reason, it’s a risk that he is willing to take. Naturally I don’t agree with this. If your friend is making a mistake, then it’s your job to stop it. Rather than cheering on Rockruff the whole time he should have been trying to stop this madness. Stepping in and knowing when not to fight is just as important as fighting. This never actually happens during the series. No matter what Akira is just there in the action and so I can’t say that he is a great trainer. The art is certainly good though. It can feel a little Shonen-esque with how intense the battles are. This is a double edged sword of course. While the battles are sharp and the character designs are on point, it goes back to how brutal it can be for the Pokemon. They take real injuries here for sure. I think it could have been toned down a bit while still keeping the intense action. It’s just a style that would work better for something like Bleach or Yu Yu Hakusho. Also, the manga just isn’t as memorable as it could have been. It’s almost scary how much you’ll forget by the end. The problem is that there isn’t much world building or even character building. The manga just starts right away with the fights and continues to the end. Fights are all you need of course, but as mentioned above it got a bit tricky in this case. I will remember the fights, but the characters and setting probably won’t last in the long run. There isn’t a whole lot to distinguish these characters from the others. You’ve got Akira who is basically protagonist 101. There’s Mana who is a nice heroine, but doesn’t have an abundance of character beyond that. We have a rival of course who seems to be a little shifty so you wonder on whose side he is really on. His character worked pretty well. The whole ending is extremely rushed with how his arc is resolved though. It’s like you go from fighting to the death one minute to a high five in the next. It’s not that extreme, but it’s the kind of character arc that you simply can’t do in one volume. Even if it may have backfired most of the time, I’ll still throw Rockruff a shoutout for fighting hard to the end every time. I do always like it when a character is always eager for a fight. Combat can be fun and aggressive characters like that always end up being quite memorable. It does work a lot better when you can talk though as we can only understand to a certain degree what Rockruff is feeling. Saying something like “I’m not done yet!” completes the message a lot more than any non-verbal queue could. The climax was definitely pretty intense though. We got some solid fight scenes and storming the villain base is always a good way to end the series. As this one was only two volumes, the fights basically take up all of the second. I think this title would have had quite a bit of potential if it was an ongoing series. I think it’s just hard to contain a lot of ideas in two volumes, but I suppose the series did a reasonable job within the time constraints that it had to follow. Overall, Pokemon Horizon won’t be remembered. It probably deserves a little more recognition than what it will get, but considering the competition it’s hard to argue for it. Pokemon Adventures is the flagship of Pokemon manga and you can’t compare the two. For lesser known Pokemon titles we have Pokemon Reburst to bring up. Still, there will always be a spot for Pokemon Horizon somewhere in there and you just have to find it. If you’ve always wanted to see a very intense Pokemon battle manga then I’d recommend checking it out. It’s like taking a look at what it would be like if Pokemon battling was an underground sport. If you want something that’s a little less dark, but keeps in the intense action then you should check out Reburst. 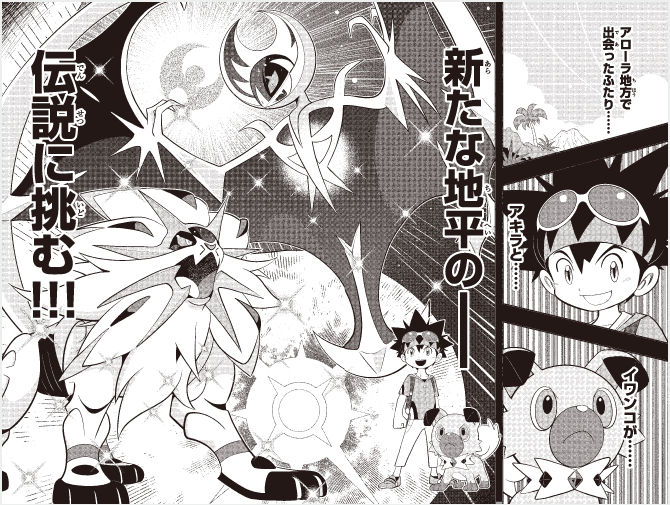 It’s time to look at a quick manga for Sun and Moon. I won’t be reviewing it just yet since I have one volume to go. It’s off to a reasonable start although I think Rockruff takes way too much damage the whole time. It all ends up working out for the lead, but I don’t think he’s the best trainer. We’ll see if he improved.